God has called Christians to overcome the world and drive back the forces of evil and darkness at work within it. Spiritual warfare isn't just casting out demons: it's Spirit-controlled thinking and attitudes. Dean Sherman delivers a no-nonsense, both-feet-planted-on-solid-ground approach to the unseen world. Spiritual Warfare for Every Christian: How to Live in Victory and Re-take the Land by Dean Sherman was published by Frontline Communications in December 2001 and is our 22284th best seller. 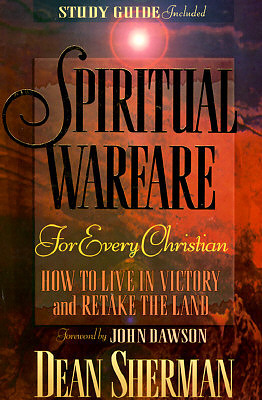 The ISBN for Spiritual Warfare for Every Christian: How to Live in Victory and Re-take the Land is 9780927545051. Be the first to review Spiritual Warfare for Every Christian: How to Live in Victory and Re-take the Land! Got a question? No problem! Just click here to ask us about Spiritual Warfare for Every Christian: How to Live in Victory and Re-take the Land.